The number one factor in establishing a dress code is for all students’ safety in class. A basic leotard and tights, along with hair pulled back and the appropriate shoes, ensures that there are no extraneous clothes or jewelry that can become hazardous. The dress code also helps teachers see that students are using the right muscles and alignment in order to learn the correct movements in class. At The Academy of Music and Dance, we want every student to feel good about trying his or her best in class. Following the dress code helps us make sure that everyone is appropriately covered ... but not so covered that their movement is restricted! 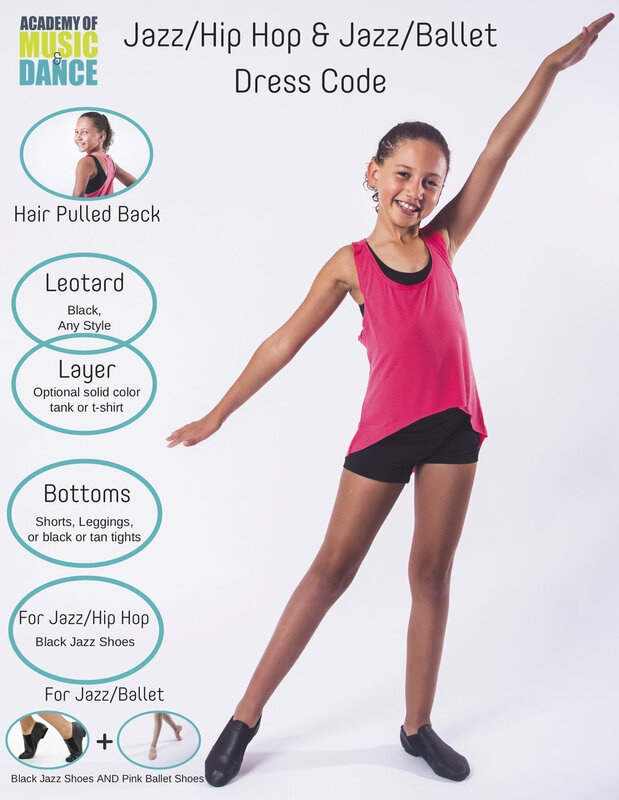 We know that kids can sometimes feel self-conscious, and we want to encourage their confidence by helping them feel comfortable with what they wear in the studio. A dress code is one way students show respect for their peers and their teachers. It demonstrates an understanding of how a dance class operates, with minimal distractions and the ability to move easily for any combination of steps or choreography. It shows that the students are prepared to learn and are willing to save their fashion statements for outside of class. Because leotards and tights also often serve as a versatile base layer for costuming, it makes sense that students become accustomed to them during class time. Just as swimmers wear swimsuits and basketball players wear jerseys, dancers wear leotards and tights to have the freedom of movement required to practice correctly and efficiently. Everyone benefits with the dress code in place: dancers can learn comfortably and instructors can teach efficiently! At The Academy of Music and Dance, we take pride in our dress code and are happy to help you with questions at any time. At the Academy we want everyone to feel comfortable and confident in dance class no matter how they identify. 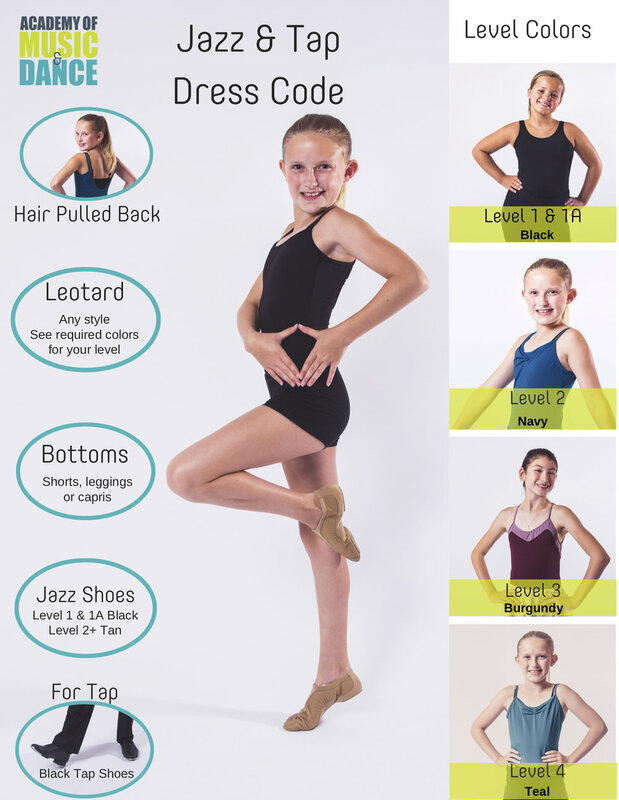 You will see our dress code examples feature predominately female representing youth as well as dress code for "Gentlemen" to give more options of acceptable dance wear for masculine leaning students. We fully encourage students to follow the example that most closely fits their comfort and identity to allow them to express themselves in a way that is safe and motivating. Proper shoes MUST be worn for classes and recitals. Failure to follow dress code including proper shoes may result in warnings and/or student observing class, or student asked to change then return to class. Warm ups and skirts only allowed at teacher discretion.